Opening up to international trade raises the return to skills in advanced economies and reduces it in the less advanced ones, according to the standard factor-endowments story. If human capital accumulation in turn depends on these returns to skills, trade should enhance human capital accumulation in the rich countries, but slow it down in poor economies. In other words, trade could serve to accentuate over time an initial divergence in income levels. As a result of trade, already rich countries should end up growing faster, while poor countries remain poor. Just a theoretical possibility? In an interesting paper, Oded Galor and Andrew Mountford argue that it is a lot more than that. This story may help account for the "Great Divergence" in economic history--i.e., why Britain took off while India, say, failed to industrialize (yes, yes, I know there are other reasons too...). It may also shed light on the failure of poor countries to converge to the living standards of the rich in the current era of globalization. It's not that there are no gains from trade for both sides. But rich countries take the gains in the form of larger income per capita, while the poor take it in the form of larger population (higher fertility). Aside from an interesting historical discussion, Galor and Mountford provide some striking evidence on the contemporary relationship between trade, on the one hand, and fertility and education, on the other. 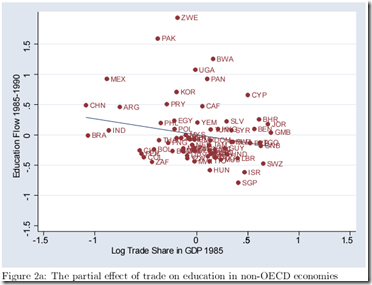 Controlling for endogeneity and other possible problems, they show that larger trade shares are associated with lower fertility and greater investment in education in the OECD economies, but with higher fertility and lower education in developing economies. 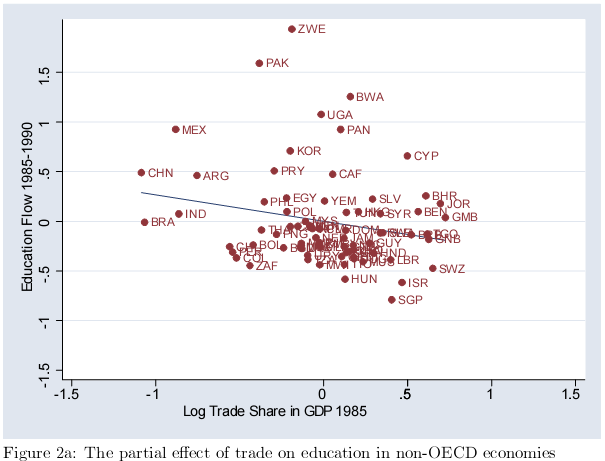 I am more convinced by the historical discussion than by the contemporary evidence (for one thing, the skill premium has generally risen--not fallen--in most developing economies opening up to trade in recent decades). But I do find these scatter plots intriguing. I had thought that one of the arguments was that population growth (in the form of increased lifespan) supported human capital accumulation, as persons made rational decisions to invest in themselves. One would have to look at both changes in population and changes in lifespan, I think. I think this could maybe be part of the explanation of the widening wealth gap in South Africa, where the average white person still earns 8 times a black person (according to a recent study by the Institute for Justice and Reconciliation (IJR)). An analysis of the flow of young (white) South Africans to other countries to gain job experience and advanced training shows that when these people eventually return to South Africa, they generally find employment at a much higher salary level than their counterparts that remained in the country. They also come back wealthier after saving money while working abroad. This is evident in my neighborhood (that is mixed race upper middle class) where most of the white people are working in international firms, or travelling abroad frequently, while most of the black people are working in government. How does this dovetail with the massive salary increases in percentage terms amongst the educated in India since circa 2000? Or soaring wages for every skill class in coastal China since circa 1978? But the poor countries that have their stuff together to a high enough degree (usually bit by bit over time) all seem to have rising per capita GDP. Think Botswana, Chile, Estonia, Hong Kong etc. In other words, build it and they will come, with "it" being good enough institutions, and "they" being actual development on a per capita basis. By the way, I am suspicious of screening out other plausible positive growth variables. I think there is a multiplier effect where different positive variables act more in a geometric manner than an arithmetic one, with the sum in effect being greater than the parts. Perhaps there are two currents at work today. Opening up of markets shifts production of skill-intensive goods to the more developed countries. 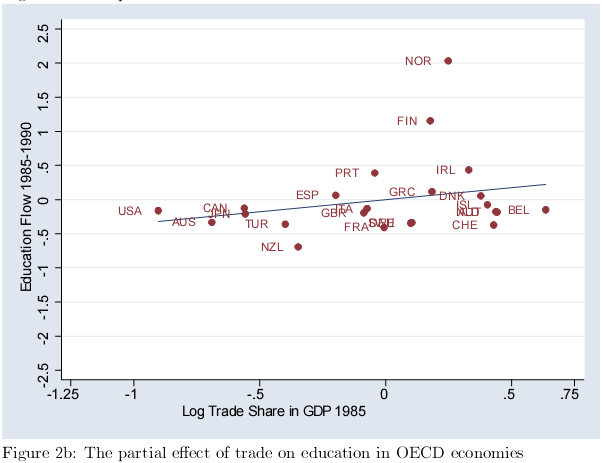 At the same time, the less developed countries grow --which also increases demand for skill intensive goods in those countries, some of which is provided domestically. People that are connected or exposed to international business practice appears to be much wealthier and higher paid than people that only interact locally. Trade in our life make to us more money. It wrights in my essay. I agree with you, richer country are taking advantage as per capita while poor ones are having higher fertility rate. I am getting good one article on trade and great divergence. I like this article very much. Could you please provide some good articles on penny stocks? Even thesis service could not write such kind of interesting thesis pdf just about this good post and perhaps, you do work especially for dissertation writing service. In that situation I could buy thesis from your company straightaway. Topic is very good, I learned many things for this blog, thank you very much for your information, nice job keep it up. Many years some men want to purchase good enough mba thesis about this post in the buy dissertation service. Can you please point at the experienced custom thesis writing services? Thank you so much. I know that lots of thesis writing services and dissertation writing service would take you to write such kind of supreme thesis report relating with this topic. I’m sure that a lot of thesis writing service or custom dissertation services can hire you to write a kind of interesting thesis sentences just about this topic. Thanks a lot for such famous issue relating with this good topic ! You have to make your buy dissertation service, I opine. Because some thesis writing services make things like that and you should create very example thesis as well. Very complete and detail information. I am suspicious of screening out other plausible positive growth variables. I think there is a multiplier effect where different positive variables act more in a geometric manner than an arithmetic one, with the sum in effect being greater than the parts. Thanks Dani - nice blog. I agree with one of the earlier comments that stated: "People that are connected or exposed to international business practice appears to be much wealthier and higher paid than people that only interact locally"
This is really an good work .I want to see something more like this from you in future too . Came across your blog by way of this article and now consider myself a regular reader. Thanks again. Thanks for sharing with your great information and I really appreciate for this website and good commenting all everybody. It has been said that world population and a prime cause of the 'Great Divergence' in income per capita across countries in the last two centuries. The analysis suggests that international trade had an asymmetrical effect on the evolution of industrial and non-industrial economies. While in the industrial nations the gains from trade were directed primarily towards investment in education and growth in output per capita, a significant portion of the gains from trade in non-industrial nations was channelled towards population growth. Trade and commerce are inter linked.These are somethings that are needed for the fast economic growth of the country.I agree with the statement of the author.The author must have studied a lot in this respect. Nice thought of Trade and the great divergence and you can use for help and I love information of this blog. It has been said of which planet population and a perfect source of the particular 'Great Divergence' within income per capita over nations inside the latter hundreds of years. The actual research indicates that overseas industry acquired a great irregular in shape effect on the actual advancement of industrial and non-industrial economic climates. Whilst in the business nations around the world size increases coming from business were directed mainly toward expenditure within education and learning and also expansion in output per person, a substantial part of size increases coming from deal inside non-industrial countries ended up being fed toward populace expansion. Wonderful article,thanks for putting this together! "This is obviously one great post. Thanks for the valuable information and insights you have so provided here. International trade has its pros and cons. The main one is, as you mentioned, more divergence of income levels globally, with basically rich countries developing more and poor countries remaining poor. Yes, poor countries benefit too...but the problem is that a slight rise in income is closely correlated to increases in population due to high birth rates, and high population means that the per capita income basically remains low. 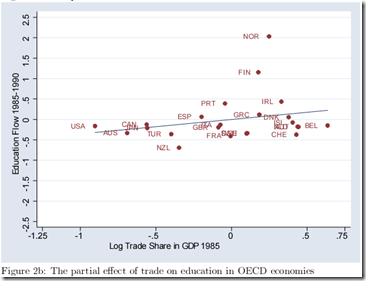 Trade and the great divergence<-- Wonderful to read! A good commitment toward trade. Trade is most powerful steep to grow a business. A good article for all traders! n most developing economies opening up to trade in recent decades). But I do find these scatter plots intriguing. on't forget to greet friends, your life is safe happiness! Trade is most powerful steep to grow a business. A good article for all traders! I like your article and want to leave a comment in your blog for your post really a very nice article. It's really an awesome blog, i am not adulate, it's have really a blatant article. I really appreciate to read this glorious article. A marvelous article in the blog. Thanks for sharing this pretty article, i really like to read about trade. I want to read to more about trade because i want to start a trade business. it is good, which can keep me informed. I'm glad to see countries trading slowly returning to good health since the GFC. Its bound to happen. nice article by the way! Divergence is only good for a limited time. We at Savers Point provide opportunity to our visitors to become smart buyer since buying smartly is not just buying cheap but buying the best at the right time from right place at right price.